When Ned and his identical twin brother tumble from their raft into a raging, bewitched river, only Ned survives. Villagers are convinced the wrong boy lived. Sure enough, Ned grows up weak and slow, and stays as much as possible within the safe boundaries of his family’s cottage and yard. But when a Bandit King comes to steal the magic that Ned’s mother, a witch, is meant to protect, it's Ned who safeguards the magic and summons the strength to protect his family and community. With a deft hand, acclaimed author Kelly Barnhill takes classic fairy tale elements--speaking stones, a friendly wolf, and a spoiled young king--and weaves them into a richly detailed narrative that explores good and evil, love and hate, magic, and the power of friendship. Once upon a time there were two brothers, as alike to one another as you are to your own reflection. They had the same eyes, the same hands, the same voice, the same insatiable curiosity. And though it was generally agreed that one was slightly quicker, slightly cleverer, slightly more wonderful than the other, no one could tell the boys apart. And even when they thought they could, they were usually wrong. The wrong boy, the village said. The wrong boy, the world said. Year after year after year. “The wrong boy,” her mother whispered, her voice as rough and dry as a mouthful of sand. She coughed. “The wrong boy will save your life, and you will save his. And the wolf—” She choked and shuddered. The Witch's Boy is my absolute favorite middle grade novel. Truth be told, I haven't read all that many of them yet - I am only just getting into the genre, but I certainly know a great book when I see one. I always thought middle grade genre didn't have much to offer to a mature, 30-year-old woman like me, but The Witch's Boy has proved me wrong - so very wrong! This is the most meaningful, beautifully written, powerful and moving middle grade book I have ever read. I have voted for it in this year's Goodreads Choice Awards and have been recommending it to everyone I know. This is a story so magical, so hopeful, so important, I believe everyone should read it. No matter the age, gender or genre preferences. The Witch's Boy raises above it's categorization as a middle grade novel. It's a timeless and gorgeously told story that is destined to become a modern classic. I know for sure I want my daughter to read it when she's old enough to read on her own. She will learn so much from it - about the world, about love and friendship, and about herself. Ned and Aine's story is full of magic. There is the actual magic - a very tricky kind of magic that needs to be contained and kept under control - and there's also the magic of growing up, discovering yourself and the world around you, finding true friendship and strength to do very heroic things. It's an exciting and heart-pounding adventure, but it's also so much more than just that. 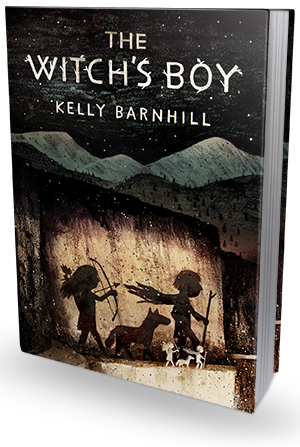 Exploring themes of loss, grief, good and evil, letting go and starting anew, family bonds and unlikely friendships, The Witch's Boy is a profoundly affecting, poignant and insightful tale of true bravery, finding your true voice and redemptive power of true love. I fell in love with this story. I loved everything about it - from the effortlessly flowing, fairy-tale-like writing (so very beautiful, it hurts! ), to the remarkable and unforgettable characters. This is such a powerful and emotional story, I am positive I will always remember it. And I will be going back to it when in need of something good in my life, something hopeful and authentic, something magical and yet painfully realistic. I can't quite wrap my mind around this gem of a book. My words can't possibly do it justice. One thing I know is that it filled my heart with warmth and took me on an unforgettable journey through the deep and scary forests, beautiful kingdoms, friendly villages and flowing rivers. And I will always cherish it.